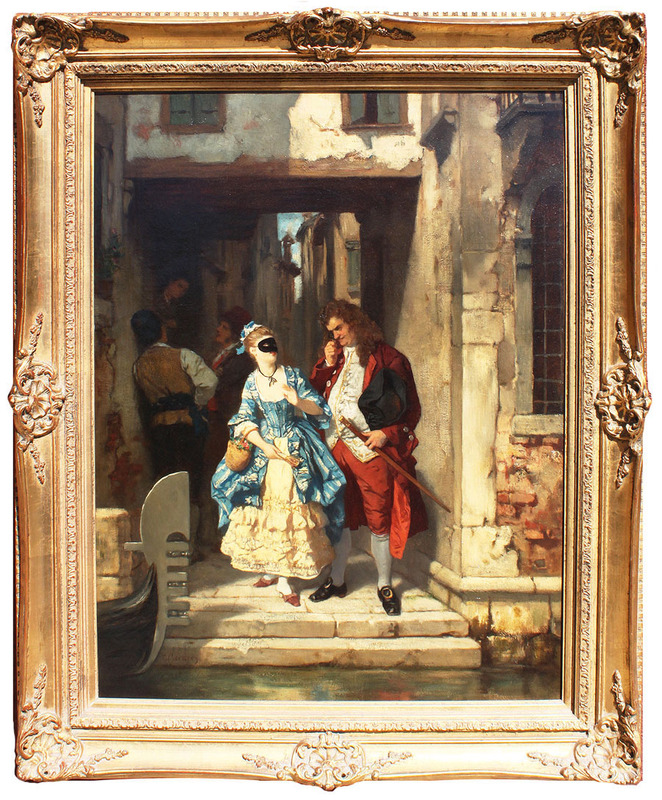 Carl Ludwig Friedrich Becker (German, 1820-1900) "Karneval von Venedig" (The Venetian Carnival) Oil on canvas within a gildwood frame. 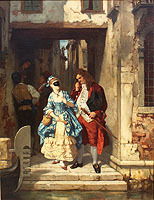 The romantic Venetian scene depicting a surprised young beauty, wearing a eye-mask, standing next to am aristocrat older man, cane and hat in hand, who stuns her as he stares at her with his monocle, both awaiting their gondola ride home. Signed on lower left: C. Becker. 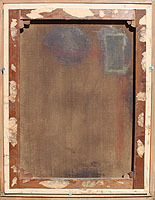 Circa: Venice, 1880. Karl (Ludwig Friedrich) Becker (18 December 1820, in Berlin – 20 December 1900, in Berlin) was a German history painter and president of the Berlin Academy. He was a pupil of August von Klöber, Peter von Cornelius, and Heinrich Maria von Hess, and afterwards studied a year in Paris, two years in Rome, and visited Venice. He first attained success with subjects of the Venetian Renaissance. Later in life, he made many visits to Venice to study paintings drawn from life in the 15th and 16th centuries. The chief characteristics of his manner are historical fidelity, skillfulness of technique, and richness of coloring. 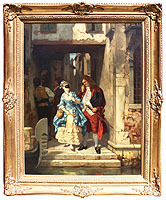 His works include “Belisarius as a Beggar” (1850), “Jeweler at a Venetian Senator's” (1855), “Visit of Sebastian del Piombo to Titian” (1861), “Doge in Council” (1864), “Charles V and Fugger” (1870), “Dürer in Venice” (1873), “Charles V Visiting Titian” (1873), “In the Picture Gallery” (1874), “Bianca Capello” (1874), “Scene from the Marriage of Figaro” (1874), “Emperor Maximilian Receiving the Venetian Embassy” (1877), and frescos for the Berlin Museum. Carl Ludwig Friedrich Becker (German, 1820-1900) "Karneval von Venedig" (The Venetian Carnival) Oil on canvas within a gildwood frame. 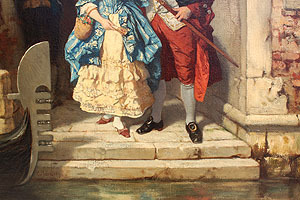 The romantic Venetian scene depicting a surprised young beauty, wearing a eye-mask, standing next to am aristocrat older man, cane and hat in hand, who stuns her as he stares at her with his monocle, both awaiting their gondola ride home. Signed on lower left: C. Becker. Circa: Venice, 1880. Karl (Ludwig Friedrich) Becker (18 December 1820, in Berlin – 20 December 1900, in Berlin) was a German history painter and president of the Berlin Academy. He was a pupil of August von Klöber, Peter von Cornelius, and Heinrich Maria von Hess, and afterwards studied a year in Paris, two years in Rome, and visited Venice. He first attained success with subjects of the Venetian Renaissance. Later in life, he made many visits to Venice to study paintings drawn from life in the 15th and 16th centuries. The chief characteristics of his manner are historical fidelity, skillfulness of technique, and richness of coloring. 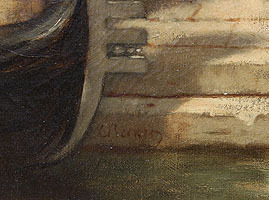 His works include “Belisarius as a Beggar” (1850), “Jeweler at a Venetian Senator's” (1855), “Visit of Sebastian del Piombo to Titian” (1861), “Doge in Council” (1864), “Charles V and Fugger” (1870), “Dürer in Venice” (1873), “Charles V Visiting Titian” (1873), “In the Picture Gallery” (1874), “Bianca Capello” (1874), “Scene from the Marriage of Figaro” (1874), “Emperor Maximilian Receiving the Venetian Embassy” (1877), and frescos for the Berlin Museum.